A playable demo of Capcom's upcoming enigmatic online multiplayer game Deep Down was available at this year's Tokyo Game Show, but unless you're in Japan and manage to get there early or have a play reservation, good luck with the 4+ hour wait. Fortunately, I was able to get through the doors relatively quickly and after only a brief 15 minute wait, got to have a little hands-on time with the demo. The demo itself was very simple, with only the very basics of gameplay involved. You enter a cave with a teleportation circle that takes you to a dungeon where you encounter some club-wielding orc-like creatures to fight. After about 5 minutes of exploring and killing, the screen fades and a cinematic cuts in where the screen goes to white and a young voice says "welcome back." Movement and camera controls are your standard L and R sticks. Holding the L1 button while you move lets you run, and holding the L2 button makes you raise your weapon for attacks. Attacks are executed with the R1 and R2 buttons with the R1 used for weak attacks and the R2 for strong attacks. Pressing these buttons without holding the L2 button makes you execute much weaker attacks that make you either jump back while attacking or give anything in front of you a sturdy shove. The directional pad and triangle and square buttons are used for skills and magic items. Press up and down to cycle through your skills and execute them with the triangle button. Press left and right to cycle through your items, press square to prepare the selected item and R1 and R2 to use it. The touch pad can be used to display the map, although I am not used to its existence and completely forgot to press it to see how it looks. The dungeon structure itself in the demo was very simple. Connected squarish rooms forming corridors and branching here and there, with varying structures. Control responsiveness had a realistic weight to it and combat was engaging and gritty. I hate to make the comparison, but it reminded me very much of my brief time with the Dark Souls 2 demo – but without all the dying. One neat element in combat I discovered was that you can destroy enemy weapons. I managed to hit one of the orc-like creatures while it was taking a swing at me and its club splintered in a satisfying crack which was very cool. Overall, the demo was very straightforward and seemed to mostly showcase the graphics and atmosphere, both of which were superb. However, there were some hints of some deeper game elements. 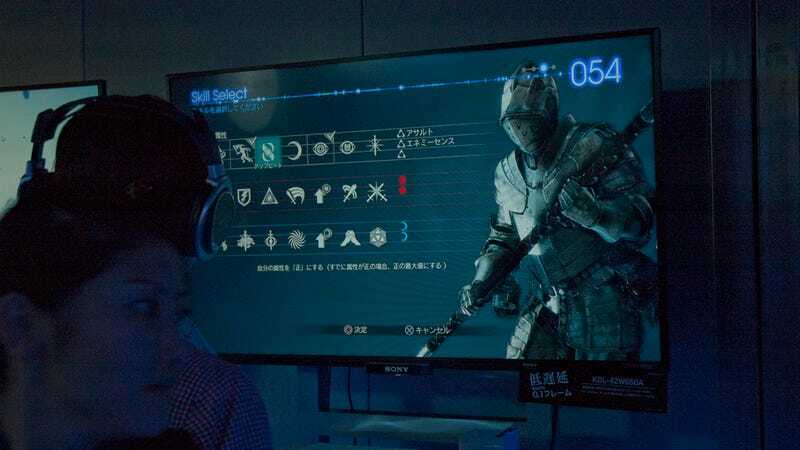 In the beginning of the demo, you got to choose from different skills: 3 "white" skills, 2 "red" skills, and 2 "blue" skills. There was also some terminology in the skill explanations that indicated an element of alignment or karma. Your character has a glowing meter behind him that seems to swing between blue, white, and red. I was not given enough time to investigate what this was, but I can only theorize that this has something to do with character alignment and it would mean that the game will have some sort of good/neutral/evil element. Story and multi-player were completely non-existent, so there's no telling how those will pan out, but as is, I'm very excited to see how the game will turn out. Deep Down looks and feels pretty cool, if not somewhat reminiscent of Dark Souls. Deep Down is scheduled for release on the PS4.